Massachusetts — American promo premium Tier VIII battleship. USS Massachusetts is now preserved as a military museum ship in Fall River, Massachusetts. She was first released for sale worldwide on 29 June 2018. 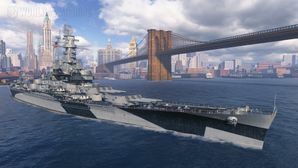 Massachusetts is the second South Dakota-class battleship to come to World of Warships, and — despite appearances — plays very differently than her sister Alabama in several ways. The primary differences are found in her main and secondary batteries. Massachusetts’s main battery has a lower sigma value and worse dispersion than that of her sister, and will generally produce slightly worse shot groupings than Alabama. The difference is slight, but noticeable. It will lead to some accuracy issues at long range, and encourages captains to close the range against enemy ships in order to improve her hit percentage; this style of play is further reinforced by her reduced main battery range compared to Alabama as well. Where Massachusetts really departs from Alabama is in her secondary battery; indeed, Massachusetts is unique among American battleships with the power of her secondaries. Her secondaries fire faster, farther, and are far more accurate than those found on any other American battlewagon. Sporting a four second reload, a max range of 11.3km, and incredible accuracy with the right buffs — such as Mike Yankee Soxisix flag ( ), Secondary Battery Modification 2 ( ), and the captain skill Manual Fire Control for Secondary Armament — Massachusetts are a terror to all enemy units that are spotted within range. Enemy destroyers in particular must be wary; these secondaries will tear them apart in very short order if they are not actively maneuvering while spotted under Massachusetts’s guns. Massachusetts brings with her the typically powerful anti-aircraft battery that veterans of high tier American battleships are accustomed to. She packs in a few more 40mm Bofors mounts than Alabama, and her dual purpose 127mm guns remain as potent as ever. Just like Alabama, Massachusetts has a small turning circle allowing some tight turns for dodging torpedoes and shells. All told, Massachusetts is an American battleship built for mid- and close range brawling, but may struggle at long range due to her dispersion and slow shell velocity (similar to North Carolina), but played well, and thanks to those secondaries, she can be a monster in players hands. As a premium ship, Massachusetts doesn't have any upgrades to research. Key skills for Massachusetts commanders include Adrenaline Rush, Basic Firing Training, and Manual Fire Control for Secondary Armament. A good Massachusetts will find themselves in brawling range of enemy ships regularly, and is well-advised to invest in Damage Control Party II ( ) and Repair Party II ( ) to maximize survivability. As a premium ship, Massachusetts comes included with Type 10 camouflage that lowers her detection radius, reduces the accuracy of incoming shells, and increases the amount of experience she earns. Massachusetts launches a catapult scout to help her aim. The sibling rivalry runs strong as Massachusetts opens fire on her sister Alabama. This page has been accessed 92,330 times.